Spray Crock Pot with cooking spray. 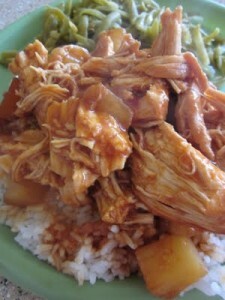 Place 4-6 boneless chicken breasts in Crock Pot. Empty in a 20 oz drained can of pineapple chunks. Cook on high for 2 1/2 hours or low for 5 hours. Shred chicken with a fork & mix with the sauce. Serve over rice or pasta.